July 2017 – We've Moved! I’m excited to write Brass Chicks’ second-ever Five Things Friday! Because I have struggled a lot over the years with performance anxiety, I have had to work to find functional solutions. In this post, I will share five of my favorites. I hope they will help other musicians as much as they have helped me. 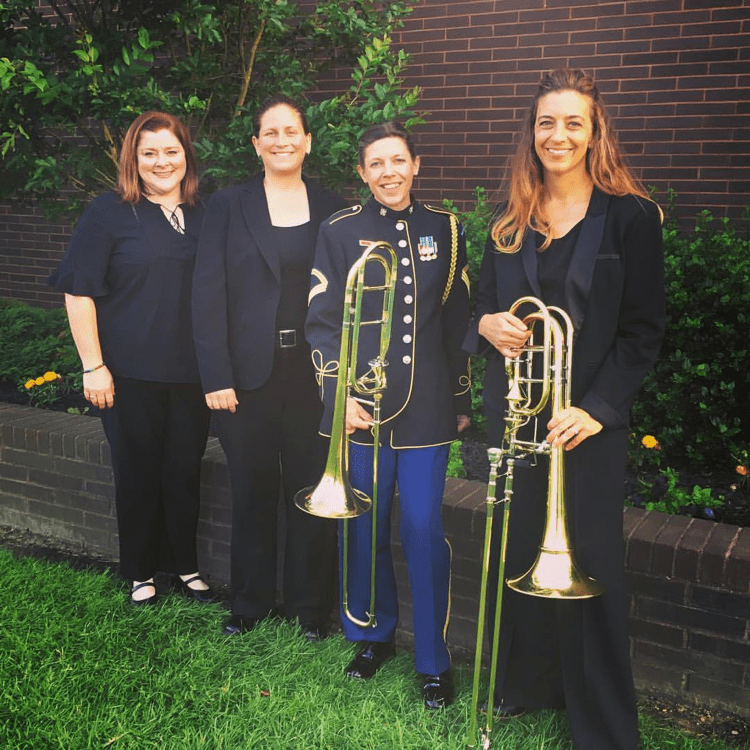 We have enjoyed celebrating the International Women’s Brass Conference through our interviews with Jennifer Wharton and Nicole Abissi and their individual blog posts. We are so excited to present our final interview of the month – featuring Joanna Hersey. Thank you again for sharing your thoughts with the Brass Chicks community! 1. Tell us a little about yourself and what you do. We are so excited to present our last guest of the month: Joanna Hersey. I met her last month when I was performing at the International Women’s Brass Conference and I knew she would be great to feature on Brass Chicks. Stay tuned for her amazing interview featuring many helpful resources and interesting experiences — posted later this week! A native Vermonter, tuba and euphonium soloist Joanna Ross Hersey studied with Dan Perantoni at Arizona State University, received a Master of Music in Tuba Performance from the New England Conservatory of Music studying with Chester Schmitz, and earned her Doctor of Musical Arts in Tuba Performance from the Hartt School. As Principal Tubist with the United States Coast Guard Band, Joanna performed throughout the country as a soloist and clinician after winning the position at the age of nineteen. Joanna has played for three U.S. Presidents, performed at numerous state functions for visiting dignitaries, and has appeared on The Today Show and Good Morning America. In her freelance career she has performed with artists including Placido Domingo, Roberta Flack, Marilyn Horne, Arlo Guthrie, Michael Bolton, Lee Greenwood, Arturo Sandoval and Jack Nicholson. Joanna is a founding member of the Athena Brass Band, a group which has been featured at the Brass Band Festivals in Danville, Kentucky and Gettysburg, Pennsylvania with Joanna as soloist. Joanna is currently Principal Tubist with the Carolina Philharmonic and the Carolina International Orchestra. As a member of the Alchemy Tuba-Euphonium Quartet, Joanna performs throughout North America and Europe and can be heard on the group’s recordings Village Dances (1997) and Prelude and Groove (2012). For thirteen years Alchemy has been in residence each February at the Horn-Tuba Workshop in Jever, Germany where the group performs recitals, gives master-classes and conducts ensembles. The quartet also has performed recitals in Linz, Austria as part of the International Tuba Euphonium Conference, and was featured in the outdoor Fest der Natur on the banks of the Danube River. 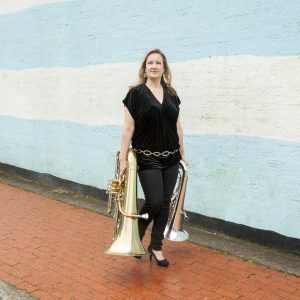 Together with Michael Parker, Joanna is also part of an exciting new duo JAM: Joanna and Michael, who have just released their first CD, featuring tuba, euphonium, cimbasso, and electronics. Joanna has produced two solo albums, O quam mirabilis (2010) and Zigzags (2015), featuring music by composers including Hildegard von Bingen and Libby Larson in combination with her own compositions. Joanna’s research interests focus on brass history and women in 20th Century American music, and her work has been published in the International Tuba Euphonium Journal, the International Women’s Brass Conference Newsletter, the Historic Brass Society Journal, the North Carolina Music Educator’s Journal and the Journal of Historical Research in Music Education. In collaboration with Parker Mouthpieces, Joanna has debuted the Hersey Artist Model Tuba Mouthpiece, featuring a three component stainless steel design. Visit www.parkermouthpieces.com for more information. Joanna is President of the International Women’s Brass Conference, Associate Professor of Tuba and Euphonium at the University of North Carolina at Pembroke, and a Yamaha and Parker Mouthpiece Performing Artist. 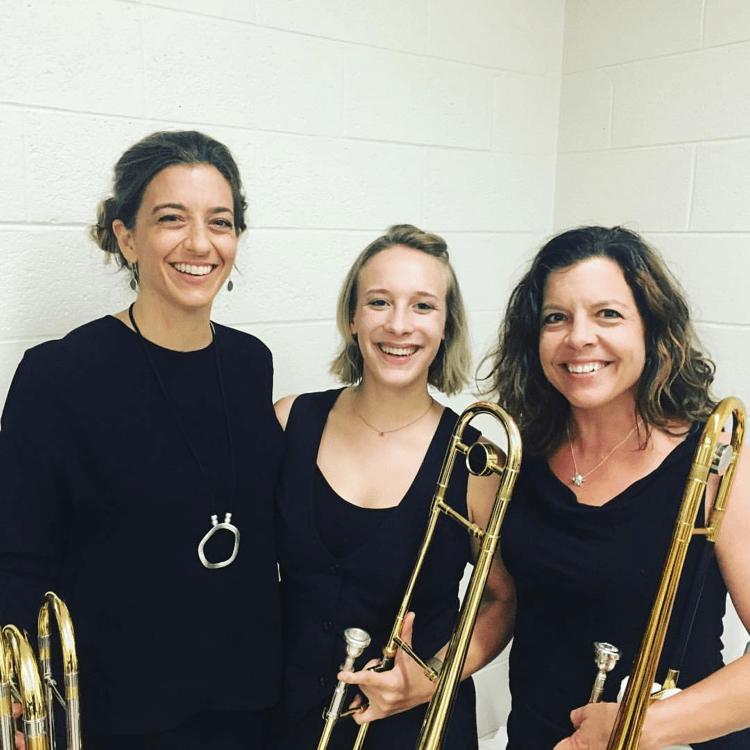 This is a re-post of Nicole’s post from her own blog, City Trombone Lessons. Please check out our previous posts for more about Nicole and her interview. At the start of this month, I had the privilege to be a part of the 25th International Women’s Brass Conference. In addition judging some of the competitions, I performed with the Monarch Brass Ensemble. Every time I play with these incredible musicians I feel inspired and re-energized. The support for one another is palpable on the stage as well as in the audience. The way that we feed off of this energy is in our musical risk taking. It is often the case that a performer expects the audience to be looking for things she or he does wrong. As if each audience member is actively ticking down marks for each missed note. After a lifetime of auditions to get into summer festivals, schools, competitions, and jobs, it’s not a surprising response. At IWBC, the overwhelming feeling in recitals is that people are there to hear what you do well. We want to know what we can like about yoour performance rather than trying to find things wrong with it, or trying to judge how we measure up to one another. I’m not sure why this is so strongly the case here and not as much elsewhere, but I do know that we should keep this in mind when each of us is an audience member in the future. Attend a performance to see what you can admire about the musicians. What can inspire or move you? Send thoughts of support and respect out into the world when someone is brave enough to put themselves out there. These acts will come back to you when you are the one on stage, and I promise you will be grateful for it. For those of you who weren’t able to attend, here are some live videos of the evening performances. Seraph Brass Indiegogo has 1 day and 2% left to go! 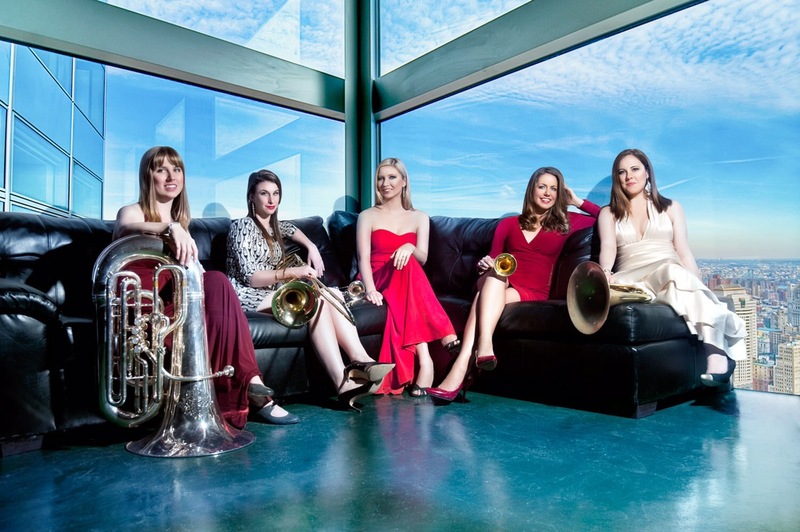 The incredible all-female brass quintet, Seraph Brass, has almost reached its crowdfunding goal on Indiegogo. The group aims to raise $25,000 in order to fund their first album, which they will release in early 2018. It will only take a few more donations to push them past the $25,000 mark — could some generous Brass Chicks make the difference? I am so excited to present Nicole Abissi – our next featured guest Brass Chick blogger, who also performed at IWBC. We have played together in NYC and I was really interested to hear her responses to our interview questions. Thanks for sharing your thoughts with the Brass Chicks community! Nicole Abissi is a member of the renowned Stiletto Brass Quintet since 2013. She frequently plays with many of the country’s fine orchestras, as well as on Broadway. Nicole received her Bachelor of Music degree from The Juilliard School and Master of Music degree from Stony Brook University. In 2007, Nicole began a fellowship with The New World Symphony in Miami, Florida. There, she had the opportunity to work with the premier conductors of our time, as well as receive lessons and coaching from many of the finest brass players in the world today. Nicole won her first professional position as the Second Trombonist of the Alabama Symphony in 2009. In September of 2012 she joined the Colorado Symphony as acting Principal trombonist for the 2012-2013 season. In addition to her performance experience, Nicole is a passionate teacher. She has given clinics at many universities as well as music festivals, such as, Georgia State University, University of Alabama, Interlochen Arts Camp, and Youngstown State University. Her students have gone on to study trombone performance at such schools as The Juilliard School, Northwestern University, New England Conservatory and Lynn University. I am so excited to create the Brass Chicks community and have the opportunity to showcase incredible stories and musicians. In addition to guest posts and interviews, there will be a variety of other posts – some themed and some not. Announcing our new series called Five Things Friday! This new series of posts will allow for many other guests to contribute and highlight their own individual perspectives. The list format is also a little different than our other posts so it may be easier to catch up with Brass Chicks related news on the go! For this first Five Things Friday post – I wanted to share 5 reasons that I am happy to be involved in the Brass Chicks community and why this project is so important. She told us that her teacher in Japan told her that due to her body structure and gender that lip slurs and other techniques would be very challenging for her. This was unbelievably shocking to hear for many reasons and we were quick to inform her that this wasn’t accurate information. She was surprised to learn that there are so many female brass players who are doing incredible things and hopefully this gave her a different perspective moving forward. This blog is for her and anyone else who may be in a situation where exposure to these powerful perspectives from women in the brass community can be extremely transformative. Even though I live in NYC (the center of the universe ) I realize that there are many other perspectives and stories worth sharing from all parts of the world. We can learn so much from everyone and I hope that Brass Chicks can be helpful in facilitating this process. So far Brass Chicks has been viewed in over 10 countries which is unbelievably exciting! When I was younger, I didn’t realize how many inspiring women brass players were out in the world doing incredible things. I didn’t realize how many different ways there were to make a living as a musician. I hope that Brass Chicks can provide some inspiration to younger musicians – at a time when it can be most valuable. There are a few other organizations that are great for brass related news – and our monthly theme is after all, the International Women’s Brass Conference, so we are very thankful for this organization and others. We hope that we can provide a space for updates and announcements in the women’s brass community – everything from upcoming CD releases to performances and more. If you have news to share – please reach out to us! We will post a monthly news update and we would love to feature your project. I love bringing people together – especially those with like-minded interests. It is an incredible opportunity to be at the forefront of Brass Chicks and create content to benefit the women’s brass community. I feel so lucky to interview some of my favorite people and feature them on our site. I hope that through Brass Chicks we can continue to positively impact the women’s brass community and create a more diverse and supportive musical environment. This is a re-post of Jennifer Wharton’s post on her own blog, View from The 4th Chair. Please check out our previous posts for more about Jen and her interview. The International Women’s Brass Conference took place this past June in South Jersey at Rowan University. On top of meeting a bunch of ladies who rock, I was lucky enough to be asked to perform with Athena Brass Band, DIVA Jazz Orchestra and in Jeannie Little’s recital/presentation. Athena was filled with professionals in service bands, brass bands and symphonies around the country and directed by my longtime friend, Jessica Sneeringer. I met Jess in the Disneyland College Band in 1999. (Read my article about it here.) After 5 extremely well-run rehearsals and a soundcheck, we took the stage. The music selection, the soloists, the level of sensitivity in the band – everything blew me away. We made some great music that night. In case you missed it, listen to the Athena Brass Band at the IWBC 2017 here. My second performance was filling in for Leslie Havens in the DIVA Jazz Orchestra. DIVA is led by drummer Sherrie Maricle and has been around for decades and has been home to folks like Ingrid Jensen, Nadje Noordhuis, Jen Krupa, Sharel Cassity to name a few. It’s always really impressive how deep the “bench” is for DIVA – there are always new players that get some of their first big opportunities from Sherrie. I always feel like it’s an honor to be able to sub in the band and try my hardest to do a great job in Leslie’s absence. There are some tasty stuff for the bass bone to play in Scott Whitfield’s arrangement of 76 Trombones and on I’m Gonna Go Fishin’. The whole concert is can be viewed here. Enjoy! Finally, on Saturday, I joined Carol Jarvis (Sting, Seal, London Symphony), Natalie Mannix (University of North Texas, Delaware Symphony) and Donna Parkes (Louisville Symphony) for Jeannie Little’s (Montana State University and loads of orchestras) recital/presentation. We played Jeannie’s arrangement of Getting Sentimental Over You and then she spoke about Tommy Dorsey and his influence on French music, specifically Tomasi. I wish I could’ve taken everyone with me back to NYC! I didn’t get to see as much of the conference as I would’ve liked. I didn’t get to talk to Abbie Conant (who I met doing a Chinese Funeral in San Francisco but that’s a different story). I didn’t get to hang a lot afterwards. But what I did hear and see and the people I did meet will stay with me for a long while. Ladies, YOU ROCK! Kate – I’ve played a couple times with Jen and it was so great to hear her perform at IWBC this year. I really enjoyed reading her responses to our questions and I am so excited to share her thoughts here with the Brass Chicks community! 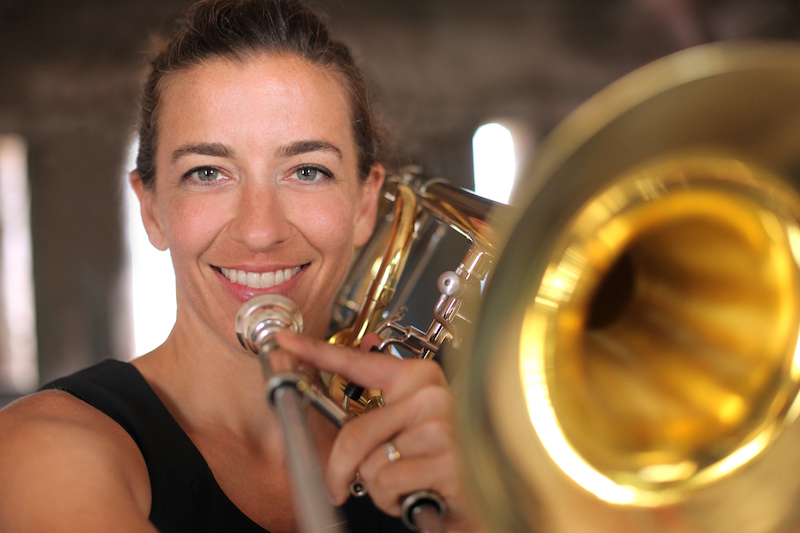 Jennifer Wharton is a low brass specialist based in New York City. Though getting her start classically, Jen has deep roots in jazz, commercial, chamber and Broadway music. Like a virus, she won’t stop until she has conquered the world. Currently, Jennifer can be found performing in Beautiful: The Carole King Musical but has also held positions at The Gershwin’s Porgy and Bess, Jekyll and Hyde, Scandalous, Wonderland, 9 to 5 and Curtains, as well as performing as a substitute in over a dozen other Broadway productions. Jen is a member of two Grammy-nominated ensembles, Darcy James Argue’s Secret Society and Alan Ferber Extended Ensemble. She has also performed on several Grammy-nominated Broadway cast albums as well as the Grammy-winning recording of Beautiful, The Carole King Musical. She has performed and/or recorded with ensembles including the Vanguard Jazz Orchestra, Ken Peplowski Big Band, Kingdom Hearts Orchestra, Ayn Inserto Jazz Orchestra, John Yao and His 17 Piece Instrument, Miggy Augmented Jazz Orchestra, Walking Distance, South Florida Jazz Orchestra, DIVA Jazz Orchestra, and the BMI Jazz Composers’ Workshop. Jennifer is an XO Professional Brass artist and plays the 1240-LT bass trombone. She teaches bass trombone at Montclair State University in New Jersey. 1. Tell us a little about yourself and what you do! Outside of music, I’ve done about a dozen triathlons including 2 full Ironman triathlons. I’m an amateur baker and I have a dog obsession. I’m married to an amazing jazz trombonist, John Fedchock, and we’ve got two doggies, Mister and Dudley. 2. Is there anything you wished you had known as a student or young professional that you know now? Any advice that you’d like to share with younger musicians? Do what scares you most. Always. Even if you fail. If I hadn’t followed this advice, I’d be working for Bank of America right now. If you go in with the mindset of “I know it won’t be perfect,” you allow yourself to try. I’m putting this concept to work this month by doing my first gig as a leader – something that I was scared about for years. 3. Any resources you recommend? Books, podcasts, recordings that changed your life etc. As a brass player, male or female, read the full story of what Abbie Conant went through with the Munich Philharmonic. It is heart wrenching and horrible but she not only survived it, she thrived. Her story showed me that the best revenge is success. When I was in college, I relied heavily on Doug Yeo’s website. There is a lot of invaluable information on there and I still refer to it when I’m teaching. 4. Lasting thoughts / tips / ideas / comments? Always be cool. There are too many great players to put up with someone who isn’t cool. Don’t be that person. We are extremely excited to present a series of posts about the recent June 2017 International Women’s Brass Conference. We will also feature a mini -interview with each post to provide more background about each guest. Jennifer Wharton and Nikki Abissi will be this month’s guest Brass Chick bloggers, sharing their insights from attending and performing at IWBC and more! Our first main interview will feature Joanna Hersey – who is the current President of the International Women’s Brass Conference. We are so fortunate they are sharing their thoughts and stories with the Brass Chick family.